With the advent of domain-specific integration tools, data synchronization between business systems has become a critical business asset. An inflexible and inefficient tool can make it difficult, if not impossible, to transform that data into actionable information required for the business. By enabling flexible and efficient access control to this data when needed by any department of an organization, you can build an Integration platform to help create a more dynamic environment for data migration and data synchronization. This, in turn, adds direct value for both businesses as well as for customers. Nevertheless, before coming to any conclusion so fast, let us delve a little bit deeper to understand the common challenges faced by an organization during migration and integration. Unquestionably, one of the greatest challenges of enterprise systems is to respond quickly to changes. Relevant data, stored in multiple applications and project repositories, are not always visible to the management using typical tools. Thus, identifying and migrating data becomes a tough challenge. Most of these integration tool applications have rigid connection systems, requiring hard-coded changes that are costly, time-consuming, and often error-prone. It is of no surprise that the more you attempt to change the ways in which these applications communicate, the more complex the task of managing the tool-to-tool data exchange environment becomes. This brings our attention to Kovair Hybrid Omnibus Migration or Reverse Synchronization Solution and the benefits of having one when using multiple ALM tools. What is this Hybrid Solution? The Hybrid solution runs on top of the Omnibus platform to perform data migration as well as bi-directional synchronization thus providing major ESB functionalities. Considering the large volume of data transactions made between the tools, Kovair offers a hybrid integration solution to take care of bulk data migration and on-going bi-directional synchronization. The architectural diagram below depicts a Hybrid solution using Omnibus as well as Hybrid clients – Windows-based application. The solution offers a complete horizontal scalability where multiple client applications can be deployed on multiple workstations for data migration or synchronization. 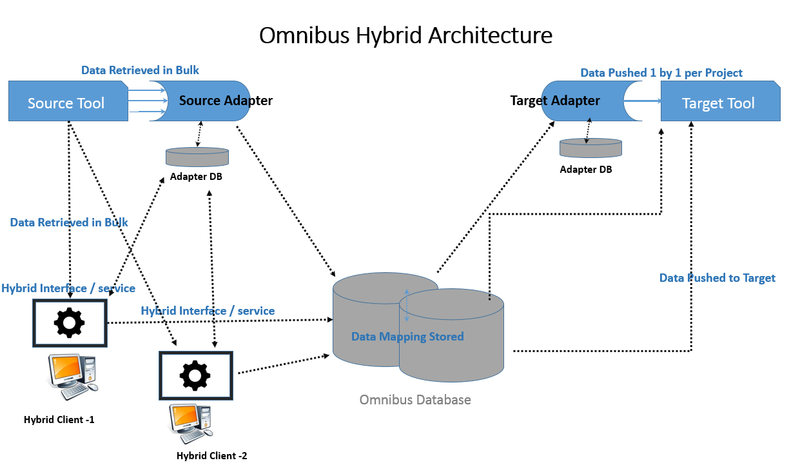 The Hybrid tool has been designed to work on top of the Omnibus Integration platform that includes adapters/connectors, central processing system, and databases; thereby making the overall solution immensely powerful and versatile. What is the need for Hybrid Tool? Shorter timeframe: situations, where bulk data needs to be migrated within a short window. Hybrid solutions have a record of migrating more than hundred thousand items over a weekend. Zero downtime: in a practical enterprise where downtime is the last option that management will accept. The hybrid solution works seamlessly to migrate data from multiple projects within the required time frame. Hence, tool users can be ported to the target tool with zero downtime. Horizontal scalability: situations where a large number of items from tool Projects are to be migrated at a given period, there is no way any solution can wait and migrate in a sequential manner. This requires parallel migration from multiple hosts. A hybrid solution can be horizontally called from across multiple host applications to distribute the load and to increase parallelism. Over 1.6 million data migrated from 1500 projects of Rally tool. Over 1.8 million data migrated from 960 applications of HP ALM tool. Migration transaction rates are around 300+ records per minute. More than 200 Windows boxes are used in simultaneous migration. Migration followed by data synchronization and execution while hundreds of end users are working with their respective tools at the same time. Entire migration of over three million records and reverse synchronization has been executed in four months with zero downtime from end users. Complete solution with a 360-degree view. The user can use multiple clients to achieve the data volume. A single user interface for monitoring all client transactions and activities. Generation of reports from any client across the ecosystem. Easy maintenance, logging mechanism, and email triggering facilities. Zero downtime during data migration. A hybrid integration solution brings you the advantage of high performance-driven transaction capability, robustness, and reliability. There are instances where data need to be synchronized overnight or on the weekends so that end users do not have to face the impact caused due to long downtimes. Another factor that continues to remain a major concern is transaction reliability. Having a reliable data migration and synchronization application in a situation where teams are geographically distributed across different continents makes an organization ready for the next generation data. As organizations continue to remain busy refining their approach to core aspects of a business, raw data derived from several applications can lead to the generation of actionable plans for better management. 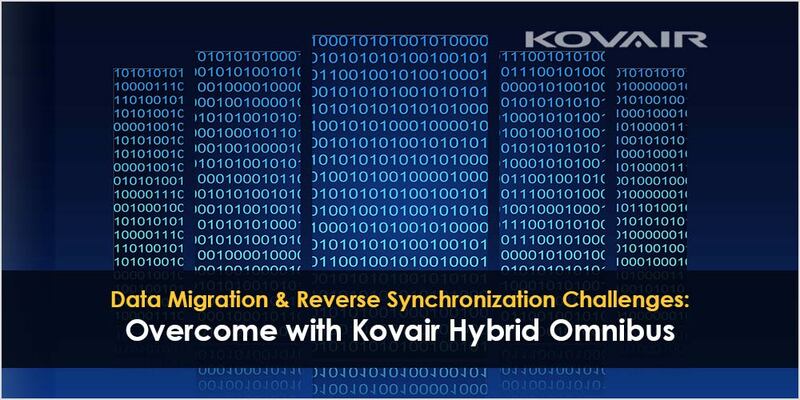 With Kovair Hybrid Synchronization in place, the data migration process can be trimmed down from several months to few weeks. Debasish Pradhan is the Project Manager - Software Development at Kovair Software. He is responsible for product design, connector architecture and supervising development in Omnibus Integrations. He has been associated with Kovair for more than 7 years and overall 11 years of industry experience. Challenges in data migrationData MigrationData Migration ToolsData SynchronizationWhy data migration?